Home › Investing › SoFi Wealth Management vs. Betterment: Which Robo-Advisor Is Better? SoFi Wealth Management vs. Betterment: Which Robo-Advisor Is Better? 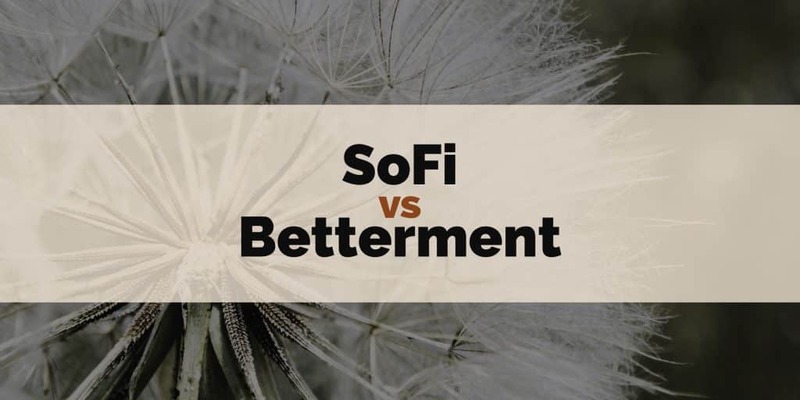 Below we compare SoFi vs Betterment to see which robo-advisor offers the best service, lowest fees and investment minimums, access to human advice and much more. Betterment got its start long before SoFi. With around $13.5 billion under management at last count, it lives up to its reputation as a leader in the robo-advisor industry. Having started about a decade ago, Betterment offers all the bells and whistles you might ever hope for: premium service with access to human advice, socially responsible portfolios, automatically balanced portfolios, tax-loss harvesting, and retirement calculators to name a few of the many perks. How can SoFi possibly compete with Betterment? Simple. It gives away its entire automated investment management service FREE. But that’s not all. Below, we unearth the differences between SoFi Wealth and Betterment so you know which service is a better match for your investing goals. Which Robo-Advisor Is Best For You: SoFi or Betterment? We compared fees, account minimums and types, services offered, tools and features offered by both SoFi and Betterment to see which fares best. Both companies offer customers compelling value propositions, with fee levels far lower than those charged by traditional financial advisors. Where both companies shine is their customer-centric business models. The benefit of low fees means savings are passed on to customers which otherwise would accrue to advisors. SoFi has created a loyal community of customers in its lending business that few financial institutions can match. Time will tell if it can energize its wealth management clients with similar loyalty. When Betterment first launched, its low fees shocked traditional financial advisors. Up until then, human advisors typically charged north of 1% annually in management fees. These days, Betterment charges just 0.25% for its basic digital money management service. If you want access to human advice, you will need to pay a bit more: 0.40% annually. These fees are right in line with rivals like Ellevest and Wealthfront. But remarkably, SoFi beats them all. With 0% management fees annually, SoFi has moved the needle on money management fees all the way to zero. But is it a case of you get what you pay for? Or does SoFi match Betterment and other top robo-advisors with a compelling service offering? Who Is Better on Fees? SoFi wins with 0.0% management fees compared to 0.25% at Betterment for its basic service and 0.40% for its premium service that includes access to financial consultants. SoFi Invest has a low sign up hurdle by requiring new customers to deposit just $100. The investment minimum is even lower if you are willing to commit to monthly deposits of $20. You won’t be locked into any holding period at SoFi. If you wish to make withdrawals you are free to do so at any time. At Betterment, the minimum amount required to get started varies depending on the service offering you choose. Betterment Digital has no investment minimum whatsoever. Don’t be mistaken into thinking basic service at Betterment is, well, basic. It’s got more bells and whistles than most of its rivals for that low fee. However, if you want access to human advice from financial experts, the investment minimum is significantly higher – you’ll need to deposit $100,000 to get get started at Betterment Premium. Who is Better on Account Balance Minimums? Betterment has a lower investment minimum for basic service but for equivalent service that connects you to human advice, SoFi has the lower minimum. When robo-advisors first launched, they were purely digital offerings. No access to live financial experts was offered if you had questions about your portfolio. Over time, most robo-advisors learned that clients like the comfort of speaking with a real person from time to time and added this perk. A rare exception is Wealthfront, which has remained true to its original vision to be purely digital while Personal Capital, at the other end of the spectrum, provides access to as many as two dedicated financial advisors to clients who meet high investment minimums. The combination of a digital advisor plus access to human advice is called a hybrid robo advisor. Both SoFi Wealth and Betterment offer access to credentialed financial experts in addition to providing a purely digital investment management service offering. SoFi has a no-commission policy for its advisors, meaning that their sole purpose is to address your financial queries versus to sell you on any other products. At Betterment if you don’t meet the high investment minimum to qualify for access to Chartered Financial Professionals, you can still connect via email and live chat to a team of live advisors. Who Provides The Better Hybrid Robo Service? Both SoFi and Betterment offer access to qualified and credentialed financial experts. For married couples and investors who have transferred assets to a trust, Betterment edges out SoFi. As the more established robo-advisor platform, Betterment caters to a broader range of account types, including joint and individual non-retirement, Roth, traditional, SEP and rollover IRAs, as well as Trusts. Comparatively fewer account type selections are available at SoFi: individual non-retirement, Roth, traditional and SEP IRAs. Individual investors and those with straightforward financial situations will be well served at SoFi, who we expect will expand the range of account types available over time, but for now Betterment wins this category. Who is Better on Account Types? Betterment has a broader selection of account types; it offers Trusts, Rollover IRAs, and joint non-retirement accounts in addition to the account types offered by SoFi, which include individual non-retirement accounts, Roth IRAs, traditional IRAs, and SEP IRAs. Tax-efficient investing is a core focus for Betterment, and specifically the goal is to increase after-tax returns. Betterment structures tax-coordinated portfolios that feature tax-efficient securities, such as exchange-traded funds, which are generally more efficient than mutual funds. It also offers real-time information which shows estimates of what taxes you owe before you make a portfolio change or withdrawal. This nudge towards encouraging smarter investor behavior can increase after-tax returns, and leaves SoFi playing catch up. Betterment employs tax-loss harvesting to systematically find embedded capital losses to lower investment taxes and increase after-tax returns. For investors with long-term holdings in multiple accounts, Betterment applies an asset allocation strategy to boost after-tax returns as part of what it calls a Tax-Coordinated Portfolio. Betterment claims that this process can produce an annual benefit of 0.48% on average, which amounts to an estimated extra 15% over a 30 year time horizon. Betterment also applies what it calls Smart Rebalancing, a process which reduces the need to sell shares to rebalance by using every cash flow and dividend to rebalance your portfolio. It claims its rebalancing process never results in short-term capital gains. SoFi also provides a rebalancing service but it does not offer tax-efficient portfolios yet. “Rebalancing is when we sell some of the ETFs that have gone up in value and buy more of the ones that went down, in order to keep your portfolio close to its original mix of investments. We will look at portfolios at least quarterly to see if any one asset is more than 5 percentage points off its original allocation. Who is Better on Tax-Loss Harvesting? Betterment pioneered real-time tax information that lets clients see the the potential tax consequences of making portfolio changes and withdrawing funds before taking action, and possibly regretting it later. Along with its trademarked Tax-Coordinated Portfolio and Smart Rebalancing features, Betterment comes out ahead of SoFi handily here. Clients who have smaller nest-eggs and are content with a hands-off service will find Betterment more than meets their needs but for those seeking a white-glove service that includes human oversight at the same cost, SoFi delivers. Anyone with a more complex financial situation, such as those who are married or have Trust accounts, as well as those looking for tools to track progress towards retirement and optimize portfolios for tax-efficiency will find Betterment to be a better fit. ✅ Portfolio Management Fees: You can’t beat FREE! As low as Betterment fees are, SoFi wins this category by charging 0.0% management fees annually. ✅ Selection of Account Types: Betterment caters to trust holders, married couples and individuals with rollover IRAs, in addition to supporting the account types offered by SoFi, which include individual non-retirement accounts, Roth IRAs, traditional IRAs and SEP IRAs. ✅ Account Balance Minimums: Arguably, Betterment wins this category thanks to its $0 investment minimum for basic service but an apples-to-apples comparison whereby clients gain access to human advisors shows that Betterment’s $100,000 minimum is way higher than SoFi’s $100 minimum for equivalent service. ✅ Tax Loss Harvesting: Betterment offers a sophisticated tax-loss harvesting service via what it labels Tax-Coordinated portfolios designed to systematically find embedded capital losses in order to lower investment taxes and boost after-tax returns. SoFi doesn’t yet offer a tax-optimized service. ✅ Free Rebalancing: Both companies offer free portfolio rebalancing that is designed to lower capital gains tax over time, and mitigate the risk of incurring short-term capital gains tax liability. ✅ Tools: Betterment has a range of tools, including its RetireGuide calculator which assesses how much you need for retirement based on a series of questions relating to your personal financial circumstances. Betterment also connects to third-party accounts to allow you link 401(k) accounts, analyze fee savings, and recommend portfolio optimizations. ✅ Human Advice: It’s a close tie between Betterment and SoFi when it comes to live advisors but SoFi gets the credit for offering the service without mandating high account minimums as Betterment does. ✅ Account Balance Minimums: For its basic service, Betterment Digital, no account minimum is imposed. For higher tier offerings, Betterment Premium, a minimum requirement of $100,000 is imposed. SoFi and Betterment both cater to investors with smaller nest-eggs seeking a hands-off, automated portfolio management solution. Betterment has the edge on advanced capabilities, such as tax-optimized portfolios, a broader selection of account types to support married couples and those with trusts, as well as investors keen to track progress towards retirement goals. It also caters to higher net worth investors who want access to financial experts via its higher tier offering, Betterment Premium. Where SoFi earns brownie points is its basic service includes not just technology-powered investment management but also access to commission-free human financial advisors and above all, its no-management fee service and low investment minimum to get started.